Friday, half-twelve and I'm twizzling my bezel in tachometric anticipation of The Trip. Are Coogan & Brydon the TV friendly faces of Cassy & Broom? Convoluted route takes us past Foxburrow Farm, Five Winds and the smart British Larder, overly restauranty for an 'umble light lunch. Tangled up in a slow convoy through Tangham, Andy times his run and powers past a "Safer Suffolk" police car. No blues and twos ensue, phew. More miles: bonjour to Butley Barn, felicitations to Froize Inn. Tis an orf'ly long way to Orford. 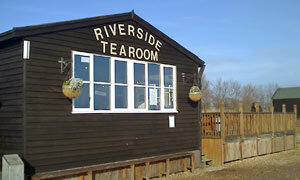 Wanted to make it to the Riverside Tearoom before weekend-only winter opening, and we have. Brisk stroll from Quay Street to the eponymous quay, left before your toes get wet and along a bit to the black shed-like structure. Now 1pm, nobody else around so we'll have the sunny table by the window. Their website is dead on: this is "the tearoom with a magnificent view", and we've got the best seats in the house. Out there sit boats, water and, within spitting distance, enigmatic Orford Ness, pagodas and all. Hard to beat, though we're here to eat. Soup didn't grab me; mine's the BLT with mayo. I realise service is going to be quicker when you're the only customers, but our orders arrive PDQ. Plus the young ladies are incredibly polite. Plus they've got newspapers. Maybe anything would taste good in that spot, but that is undeniably a top notch bacon sarnie. While we're nibbling and gawping, a couple of other hungry horses arrive and can't help but crowd our personal space. Live and let live. Executive decision to go above decks for dessert. Those exterior tables seemed mighty inviting; reality is somewhat cooler, this being mid-November. Warmed, sweetened and jolted by standard order of double macchiato and carrot cake, both more than up to scratch. A man could grow to like this place. If it was a car -- AC Aceca. If they were passing by -- Philip Pullman.